The winter season is dangerous for motorists because of the weather conditions that accompany this time of year. While rain, snow, and ice are dangerous driving conditions, an even more dangerous condition to look out for is black ice. Black ice is a tricky shade of ice that often hides in shade and shadows. If run over at even the slightest speed, they can cause spin outs, resulting in auto accidents. It is very important for drivers to be able to identify these icy patches so as to be able to maneuver around them in a safer manner. These icy patches typically form at freezing point when the falling rain freezes upon impact of hitting the ground, thus becoming instantly frozen by the temperature of the ground. Black ice is also created by sleet and the refreezing of snow or water. They sometimes appear as a wet floor from a distance. Black ice likely also appears after snow has melted on roads and the temperature drops once again. Shiny patches on the road are usually indications of black ice. Driving over them at even a regular speed can mean trouble for the driver. As the old saying goes, prevention can be better than the cure. Therefore, it is crucial to educate drivers on how to identify black ice when driving. With the presence of snow, motorists tend to be more careful and drive slower. Since black ice is more difficult to spot than snowy roads, it is easier to overlook, leading to accidents. If you live in areas prone to this type of road condition, it is important to always keep your eyes on the road and be vigilant for dangerous road conditions. It is also important to be aware of the temperature. 32 degrees or below will cause the formation of black ice. Avoid shady areas where ice might have fallen on or roads that run through places where they are not exposed to the sky. Examples are roads that run under bridges. Find out the temperature of the road before you start driving, as this would help you in determining the road conditions. 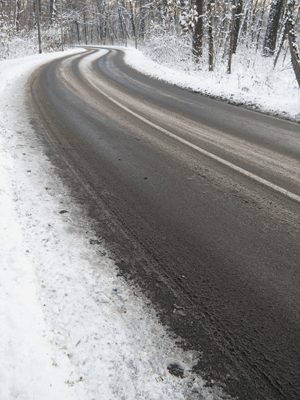 If the air temperature is freezing temperature, simply assume that every wet spot you see on the road is black ice. Do not step on the brakes in an attempt to stop your car. Instead you should firmly grip your steering and try as much as possible to keep it steady. Do not accelerate your car; keep driving at the same speed. If the black ice appears to be getting the best of the situation by changing the direction of your car, do not overcorrect your steering wheel. This can make things worse. How do you steer clear of black ice? How do you react once you hit an icy patch?